Construction management is a multi-faceted career field with many diverse employment opportunities. To work in this industry, you’ll need the proper credentials. Many schools now offer degrees in construction management as well as related fields, such as project management, contract management, and general management, in order to best prepare graduates for career success. The associate’s degree is typically earned in two years and provides a general foundation for a student’s education. Certification programs are not the same as degrees, though one can lead to the other. Some certifications are post-graduate specializations and can only be obtained after completing a master’s degree program. Students pursuing a bachelor’s degree in construction usually earn a Bachelor of Science (BS). A BS in a construction management teaches combines both technical and engineering instruction with a solid business background. A bachelor’s degree program includes core curriculum classes like English, mathematics, and history, as well as upper-level courses specific to construction management. Construction, construction management, and construction science management programs build upon the educational foundation from a bachelor’s degree in the field. Construction administration programs highlight project management with an emphasis on construction safety. Building construction offers advanced instruction specialized in technical areas such as planning and scheduling, materials, high rise construction and building techniques. Construction engineering management programs spotlight engineering and industrial applications of construction methods. 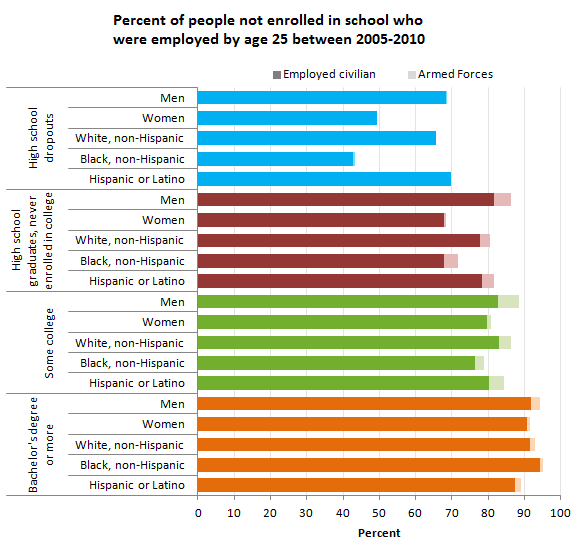 The graph below illustrates how important it is to receive higher education. Over a five-year span, those with a higher education degree were more likely to be employed than those who did not graduate from a post-secondary institution. While the survey conducted by the Bureau of Labor Statistics did narrow their demographic to those at age 25, other studies have proven similar results for the entire workforce. Electrical installation – Knowing how to construct a building to accommodate the necessary electrical wiring and appliances is crucial for construction managers. Residential building – Zoning laws are different for residential buildings than for commercial spaces and government buildings. Construction managers need to apply for the proper building permits for each project. Demolition and reconstruction – Taking buildings down in such a way that building materials can be reused is growing in popularity as renewable and sustainable architecture takes off. A construction manager with a knack for green building will be ahead of the curve in this competitive job market. Architectural drafting – Drawing up plans for a building is an art unto itself. Architects study for years to learn how to communicate the exact proportions, as well as the look and feel, of a building on paper. While a construction manager doesn’t need to make these drawings, they do need to know how to read them and build from them. AutoCAD: Short for Automatic Computer Aided Design, this software is a widely used platform for developing 2D and 3D graphic models of both internal and external structures. Knowing something about AutoCAD will help construction managers be able to more easily communicate with the architects and designers they work with. Google SketchUp: This is a free, rich modeling software that is good for making mockups of buildings or just visualizing the way a space should be laid out. There is a Pro edition of the software which costs money, but the free edition is a great learning tool for construction management students to take advantage of. ProEst: An extremely popular genre of software for construction managers that has blossomed in the past few years is cost estimation software. ProEst and others like it use algorithms to predict the cost of a project, so that contractors can offer potential customers a better price than the competition. There are dozens of options for this type of software, and as they get more sophisticated, it will be harder and harder to beat them using old standard methods like spreadsheets of old pricing data. While basic computer literacy is a prerequisite of any type of higher education and is necessary in any career field, the above programs will be especially useful to aspiring construction managers who want to stay ahead of the curve. Work at a Construction Site: If you’re physically able and willing to put in the hours, getting a job at a construction site shouldn’t be too difficult, and you can learn what it is really like to work in the industry. Shadow a Construction Manager: Contact a construction company and see if you can visit one of their work sites and shadow the manager for a day to get a feel for what their job is like. Internships and Volunteer Opportunities: Many college programs require students to do a semester-long internship for credit in order to graduate. Some companies will even pay interns an hourly wage, though many only provide college credit. Even if your college doesn’t require an internship or volunteering, it is a good way to make professional connections and help to secure employment after graduation.